Disclosure: We received a free copy of the DVD to facilitate our honest review. All opinions stated are those of the Shelly's Bits and Pieces family. We love watching all kinds of movies. We recently had the chance to watch Ronin 47 and want to share our thoughts with you. About the movie: Based on an epic story, this extraordinary tale of inspiring courage has its origins in the early 18th century. After a treacherous warlord kills their master and banishes their kind, 47 leaderless samurai vow to seek vengeance and reclaim their honor. 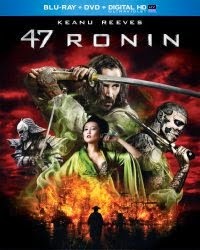 Transformed into a thrilling, visually stunning 3D film by director Carl Rinsch, 47 Ronin tells the story of a small group of warriors, or ronin, on a quest to avenge the death of their master. Battling across a savage world of mythical beasts, shape-shifting witches and wondrous terrors, the ronin must seek help from kai (Reeves), an enslaved half-breed they once rejected – in their ultimate fight for redemption. Our thoughts: Chefy and I really enjoyed this movie. It was action packed, and it even has a love story too. This movie is ideal for anyone who enjoys movies about samurai warriors, fighting and good overcoming evil. I was worried initially that I would not be able to sit through the whole movie, because I am not that in to the samurai stuff, but there was enough of an interesting plot line to the movie to keep non-action buffs watching. Father's Day is just around the corner. Why not give Dad a movie for his big day?